Since taking over the rescue over five years ago, Nobby and I have spent every holiday from work travelling around raising funds. We dedicate all our spare time and I spend many hours each night either on the phone or messaging people who need support, speaking to applicants to check their suitability etc etc. It is now time to move on and concentrate on our family, dogs and paid jobs. I personally want to thank the admin team who have worked hard behind the scenes and kept me sane throughout this journey, thank you!! 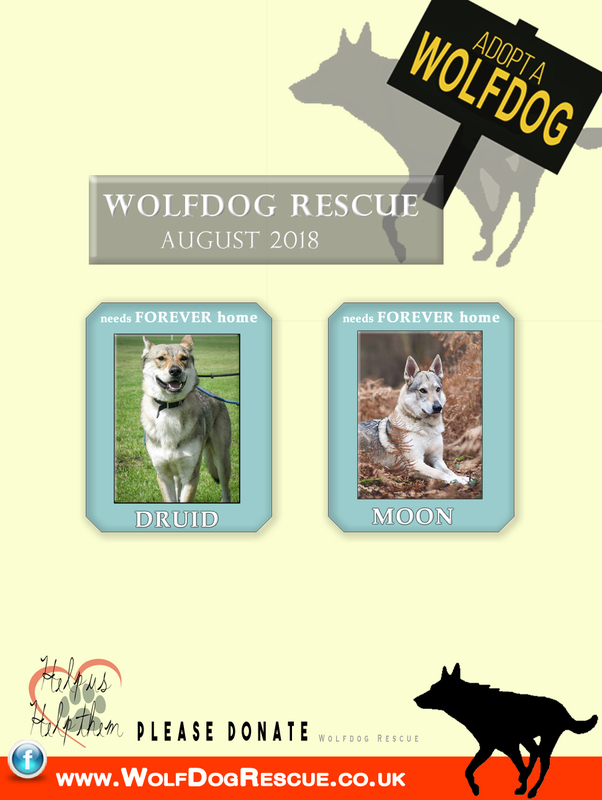 Moon and Druid are now settled and happy in their new homes, unfortunately Wizzard is coming back to us, we will be looking for his new home and his advert will follow, once Wizzard is happy in his forever home we will close the rescue group and page. For all those who have set up monthly donations either via paypal or our bank account can you please cancel the payments? We will be doing the final accounts soon. We still have two dogs that need neutered as they were too young at time of adoption, we will be honouring our contract and paying for the neutering as agreed at time of adoption. Once we receive the final kennel fee invoice, final insurance payment etc any monies left over will be donated to the Wales Ape & Monkey Sanctuary. 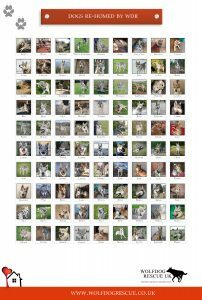 Graham, who runs the sanctuary, now has a total of 8 wolfdogs so we feel the money donated and raised will still be going to help wolfdogs. The WdR van has being donated to Sam Bryce and her not for profit company helping track missing dogs. 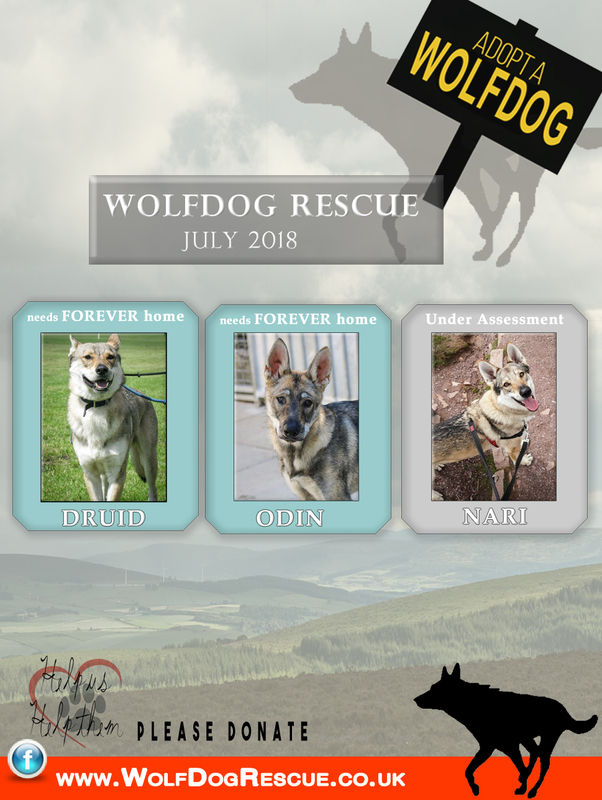 The attached photo is the dogs we have rescued over the years, unfortunately some are no longer with us, but hopefully they are running free over rainbow bridge causing mischief, most of the dogs seen here are happy in their forever homes, it is great to be able to say I am in touch with each and every owner except one and I will remain to be there for support to all WdR owners, our closed owners group will be the only group that stays open. 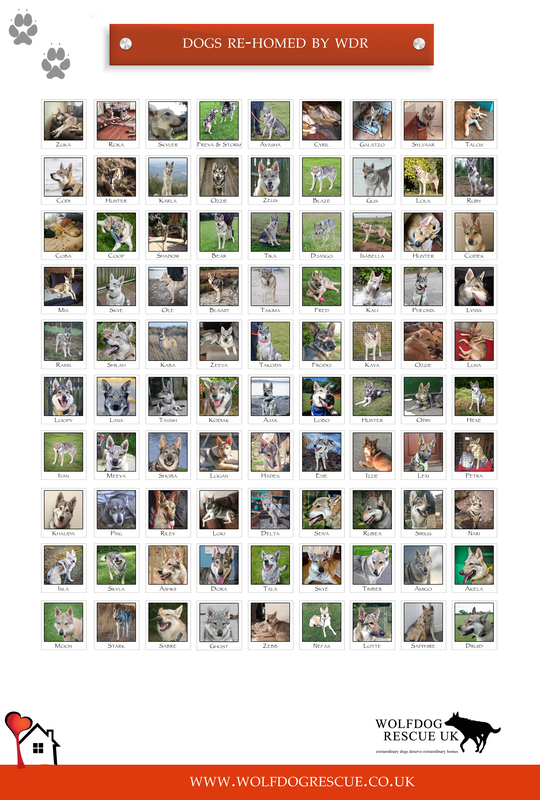 My personal parting gift to the breed will be an attempt to stop the KC from registering the Czechoslovakian Wolfdog as a breed, I strongly believe it will have a devastating effect on the dogs and we will see an increase in back yard breeders cross breeding without the necessary knowledge, which will have serious consequences affecting the health and temperaments of Wolfdogs. I do not believe there are enough suitable homes in this country for them to become a recognised breed. We all know how challenging they are, they are even more challenging to re-home as many will have seen by following us over the years. Take time to reflect on the things you have had to change in order to accommodate them and for them to be part of the family, then ask yourself how many others would go to the extremes some of us have needed to go to, how many people do you know who has the time, commitment and determination to give these dogs what they need. I may not be successful in stopping the registration of the breed, but I will do my best for all of us who love our dogs and who understand the consequences and impact this could have on all of us and our beloved pets.